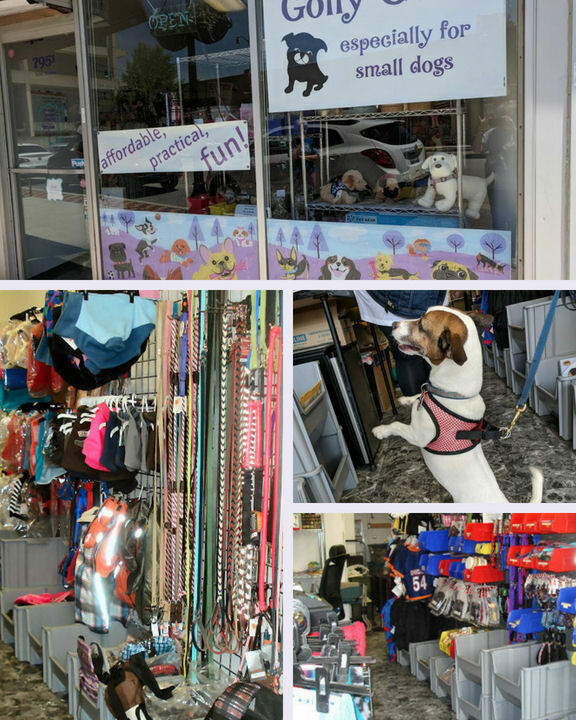 With more than 20 years' experience in retail and over 40 years living with little dogs, we know that customers want great merchandise, reasonable prices, and prompt service. We pledge all of these. We also promise to listen to you. If there's something you've been looking for, let us know. We'll do our best to find it. To be notified of our monthly specials, just click the box to the left and give us your email. (You'll receive a note from us with a nifty gift!) E-mail us with questions, stories about your little dogs, stuff you'd like to find, and e-mail us pictures!!! Lots of pictures! We want pages and pages of pictures in the Gallery or even on product pages! We love to get pictures of your dogs enjoying their GollyGear, but we won't post them without your okay, so please say it's okay to post your dogs' pictures!. 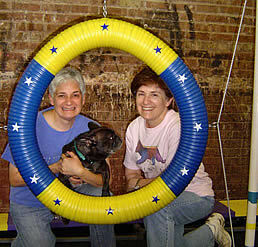 About our pictures: All the dogs pictured wearing Golly Gear apparel are our, or our customers' dogs! The only payment these dogs received was in the form of treats! Same goes for product videos. 10% of Golly Gear profits go straight to small dog rescue organizations. Just because it's the right thing to do. We will never share any information you provide without your permission. We will never share name, address, telephone, credit card or other payment information. To strengthen our security of your information, we have added "Captcha" technology (you may have to enter the letters and / or numbers that are shown) when you register for or log into your GollyGear.com account. We don't want automated systems discovering anything about our customers! We want you to be happy with all of your dog's GollyGear. And we want you to have the best experience in purchasing GollyGear. You can shop safely at GollyGear.com. We use a secure on-line shopping cart that is PCI-compliant, so you can safely use your credit card when checking out. We have a SSL (Secure Socket Layer) certificate from GeoTrust. We (Hope and Fran) do not even have access to your credit card information when you check out online! To checkout, just click "Checkout" at the top of your screen and you'll be taken to a secure page to complete billing, shipping and credit card information. We accept Visa, MasterCard, Discover, American Express cards. PayPal is another payment option on the payment screen. Sales tax on orders shipped to Illinois addresses is 10.25%. If for whatever reason you need to cancel your order before it ships, please contact us immediately by phone or email - we ship quickly! Your credit card transaction will be voided if cancelled the same day as the order, otherwise the total amount will be refunded. If you paid by PayPal, a full refund will be issued. We won't gouge you on shipping. We hate when it happens to us, we won't do it to you. You can see your estimated shipping charge after you put items in your shopping cart. Some large items are oversized and additional shipping costs will apply. This will be noted on the product page. For U.S. orders over $49, standard shipping is free. Be sure to click on "First Class" or "Standard Shipping" in the Shipping box. International orders - You may be subject to import duties and taxes, which are levied once a shipment reaches your country. Additional charges to clear customs are the responsibility of the recipient; we have no control over these charges and cannot predict what they may be. Customs policies vary widely from country to country; you should contact your local customs office for further information. Mail Orders - If you choose to place your order by mail, please refer to the chart on the order form. The fees are generally based on US Priority Mail service. We ship most orders within 24 hours. If you place an order after 12:00 (noon) Saturday, Central Time, the order will be shipped on Monday. Orders placed on US National Holidays will be shipped the following business day. If our timetable changes, we will let you know. We try to make sure that the items available for online ordering are in stock, but sometimes we do sell out of particular items. If the item you've ordered is not currently in stock, we will email you to inquire if you'd like to cancel the order or send the item(s) to you when our new stock arrives. Satisfaction Guaranteed - We want you to be happy with every purchase from Golly Gear. Please contact us (800-694-6531) with any question or issue and we'll do our best to resolve the problem. Exchanges - We hope all your Golly Gear fits perfectly, but if it doesn't, you may exchange any item within 30 days. There is no additional shipping charge for exchanges within the United States. Ex-US customers, please contact us. Returns - We will accept returns within 30 days of receipt. Merchandise must be in original condition. The purchase price will be refunded. Shipping charges are non-refundable. Food items and tags (customized items) cannot be exchanged or returned. Any item shipped directly to you by the manufacturer and not by Golly Gear (drop-shipped items) may incur a 15% restocking fee. Again, we will never share any information you provide without your permission. Thank you for visiting our web site. Your comments are greatly appreciated. If there is a product you know of that you'd like us to find or feature, please let us know. E-mail us with any questions you may have, we'll be happy too answer them. And we love to get pictures of your dogs enjoying their Golly Gear (by all means please! email us pictures! ), but we won't post them on our website without your okay.